Priyanka walked the Oscars after party red carpet in a black shimmer dress, while Nick sported a blue suit. After the event, they took to social media to share photographs of themselves as they shared some fun and cosy moments together. 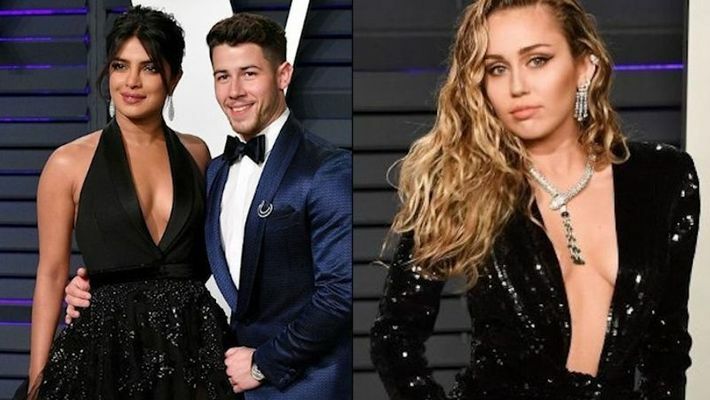 Actress Priyanka Chopra's appearance at the 2019 Vanity Fair Oscars after the party has left not only fans but also singer-actress Miley Cyrus, who was once romantically linked to Priyanka's husband Nick Jonas, in awe of her. When celebrity make-up artist Pati Dubroff on Monday posted a photograph of Priyanka's party looks on Instagram, Miley's comment on it set tongues wagging. Miley complimented Priyanka saying, "pretty love". Priyanka walked the Oscars after-party red carpet in a black shimmer dress, while Nick sported a blue suit. After the event, they took to social media to share photographs of themselves as they shared some fun and cosy moments together. "Black Panther" actress Lupita Nyong'o also took to the Instagram story to share her happiness after meeting the newlyweds. "Finally met the Jonases," wrote the actress of the film, which won three Oscars on Sunday night. Re-posting Lupita's post, Priyanka said: "So good seeing you, Lupita, we need to do it more often!"